I have been in a wheelchair all of my life. 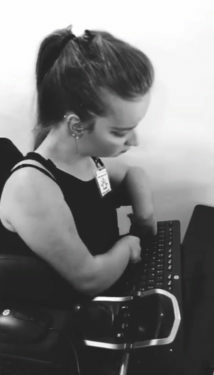 I was born with a disability called Ehlers-Danlos Syndrome Type 7A – a connective tissue disorder affecting my muscles and joints – and have had almost 30 major surgeries. I couldn’t have done it without God by my side. I face many obstacles, some are harder for me, but I have always found strength in my faith. “I can do all things through Christ who strengthens me” (Philippians 4:13). My Catholic faith has allowed me to grow into a young adult who has compassion, empathy and genuine concern for others. To be a leader in any capacity, you must possess certain character traits such as courage, respect and commitment. Through my Catholic faith, these traits have been instilled into my character and helped me to consistently be a leader in my school. I attend the Henry Viscardi School, which is a secular institution. Daily interactions with people of different faiths and beliefs can be challenging at times, but I am tolerant of everyone’s ideology and devotions. Through maturity and experience, I learned to draw on my inner faith and upbringing to treat all that I encounter each day with the respect that they deserve. Just because others may not follow the Catholic religion doesn’t mean that I can’t use my Catholic values and morals to conduct myself in a manner that makes me a positive role model. 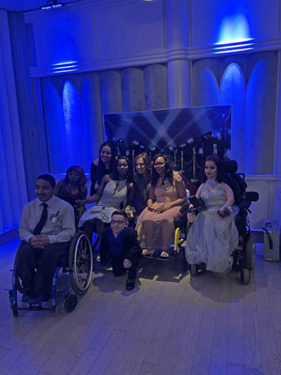 As a member of Viscardi Ambassadors, I go out into the community and talk to students from elementary school through college about acceptance and awareness of people with disabilities. I am one of only five seniors who was selected to represent Henry Viscardi School in this important program. My faith is present in all the Viscardi Ambassador presentations as I strive to share valuable insight into my life and guide people to gain understanding and acceptance. I attend weekly Mass to maintain my close relationship with Jesus and have learned that Church brings people together that may have nothing else in common and that there is no room for judgments or intolerance when worshipping the Lord. I am confident that with Jesus by my side, I will be able to navigate any situation presented to me in a manner that would make Him proud. My faith provides the fortitude needed to face daily occurrences, both positive and negative, with strength and dignity. For instance, when I have surgery I always think the worst. Questions go through my head like: ‘Will everything go well?’ ‘Is the surgery going to make it worse?’ But then, I remember that with God by my side, I will get through it and He has never let me down. I volunteered at a nursing home. This experience brought me closer to God. One day, I was doing recreation with the patients and I gave them ice cream. They were so happy and thankful for something that I thought was so small! This sparked a light in me that I have to appreciate the little things in life that God gives me, like making it out of surgery. Everyone has a different relationship with Jesus, which is formed throughout our lives and rooted in our faith. My relationship with Him is natural and comfortable for me. I trust that Jesus will never stop loving me and will always be there to get me through each day. I trust Jesus and He trusts me in return. Jesus shows this to me by allowing me to make decisions about my own life and also by putting His faith into me that I will follow His example in all that I do. My relationship with Jesus is based on trust, love and communication. Our bond is deep and natural. Including Jesus in my daily life is what helps to sustain the bond that I have with Him and motivates me to keep going and not let anything stop me. Keeping a strong faith is important and sometimes difficult, but vital to me not becoming distracted by others and always being the person that I truly am. Attending Mass and receiving the sacraments is something that I will always carry with me. The teachings of Jesus are something that I use in my daily life. Understanding and kindness are traits that I exhibit and encourage in others in all activities throughout the day. I hope one day to become a disability lawyer. I also hope that after you read my story you don’t feel sorry for me, but rather that you feel inspired. When you feel like you cannot handle something in your life, always remember that God is there. Turn to Him and He will guide you in the right direction. Always have faith. God bless. Dalonzo is a senior at Henry Viscardi School and a parishioner at St. Mel’s in Flushing. 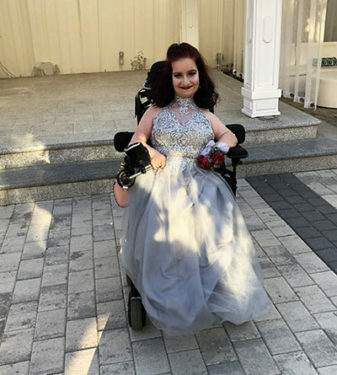 Editor’s Note: Jessica attended prom the week this article was published. Below are photos she shared with The Tablet.